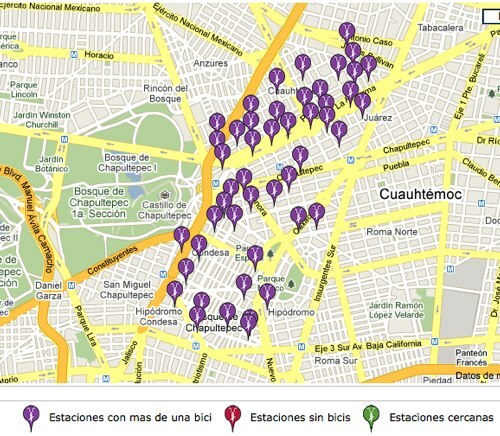 Ecobici, Mexico City's new bike-sharing program, shows the location of bike stations in operation and available bicycles on its Web site. Last week, Mexico City came a couple steps closer to reducing the 5 million vehicles that pass through it each day with the launch of its new bike sharing program, Ecobici. The Federal District’s Head of Government, Marcelo Ebrard; Mexico City’s Secretary of the Environment, Martha Delgado; and Jorge Dzib Sotelo, director of Ciclismo Para Todos (“Cycling for All”) kicked off this innovative program. Ecobici is a trail blazer in the Western Hemisphere. A public bicycle system like those that have transformed transportation in Paris, Milan and Barcelona, Ecobici is the largest year-round bike-sharing system in North America and one of only a handful of similar programs in Latin America (including Rio de Janeiro, Santiago and the Brazilian city of Blumenau). Ecobici has more than 1,000 bikes and 85 stations in the districts of Roma, Condesa, San Rafael, Cuauhtémoc and on the Paseo de la Reforma. An annual membership costs 300 pesos (about $23). The first 30 minutes of rental are free, the next 30 cost 10 pesos ($.80), and additional hours cost 35 pesos ($2.70) each. The program’s promoters hope to garner 24,000 subscribers in the first year of operation. This will contribute to the city’s goal of increasing the bicycle mode share from 1 to 5 percent. Mexico City has been a leader in bicycle planning, having committed to build more than 100 miles of bike paths by 2012. Policymakers recognize the city’s extreme levels of air pollution and congestion require an urgent solution, and bike infrastructure is a crucial piece of that. With the health and environmental benefits of cycling, “Ecobici makes a lot of sense,” Ebrard said at the launch. What’s more, biking is economical – it’s the cheapest transport mode in Mexico City, at just 82 centavos (less than $.10) per day. And it compliments the public transit network, with easy transfers between bicycle and Metro, Metrobus and trolleybus. With Mexico City’s congestion, there are safety concerns. Officials cited the need to reform traffic laws and strengthen penalties for drivers who do not respect cyclists and pedestrians. 450 police officers will be trained to support and protect bicyclists. The city already had a private bike sharing program, Mejor en Bici, but Ecobici, promoted by the government and supported by Clear Channel Outdoor, is considerably larger. Though its bikes are technically “free” to use, Mejor en Bici requires a deposit of 200 pesos ($15) to rent a bike, which is then refunded to users upon return of the bicycle. Though such a large deposit is probably necessary to avoid bike theft, 200 pesos may have been viewed as too much by some potential cyclists. Ecobici has started with a bang: A few days after its launch, 1,000 people had already signed up for the program. Pending the success of this first stage, Ecobici may expand to other areas of the city, with an eventual total of 6,000 bikes. Could Bike Sharing Work in Jaipur?